Are you looking for affordable professional backup software, Ashampoo Backup Pro 11 may just be what your looking for. 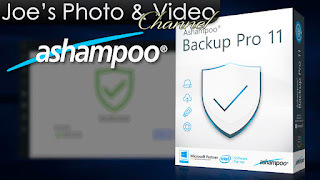 In this video I gives you a hands on review and easy demonstration of Backup Pro 11. I will show you have to setup the software to start your backup and also have to restore your files as well as complete drive restoration. So not only is this a review of the software, but it is also a brief tutorials on how to use it. Keep your photos and videos safe & secure.